Irvine, Calif. and Los Angeles – R.D. Olson Construction is commencing construction on a $44.5 million hotel project, the Residence Inn by Marriott at Los Angeles International Airport (LAX) in Los Angeles, Calif. The Irvine, Calif.-based general contractor was chosen by new owners, SVI LAX, LLC, to convert the 12-story office building to a 231-room, extended stay hotel. The new hotel will feature the Residence Inn by Marriott’s latest Generation 9 design, with guest amenities that include a pool, spa, fire pit, sports court, exercise room, business center and meeting space. The hotel entrance will include a backlit, free-flowing sphere porte cochère to welcome guests and solidify the building’s new identity. Located at the gateway to LAX on West Century Blvd., the new Residence Inn will also feature 3,000 square feet of retail and restaurant space. “Complex construction projects like this office-to-hotel conversion give R.D. Olson the opportunity to put our diverse construction experience and hotel industry expertise to great use,” said Bill Wilhelm, executive vice president of R.D. Olson Construction. The Residence Inn by Marriott at LAX is slated for completion in January 2015. Additional R.D. 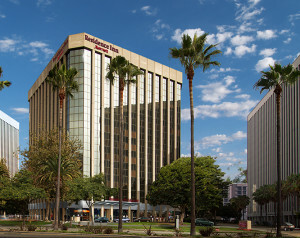 Olson work near LAX includes a renovation project for Hazen’s Real Estate Group to refresh the Sheraton Gateway Los Angeles Hotel. Plans call for the renovation of 804 guest room suites, lobby and dining areas, and will require R.D. Olson to work around various functions while the hotel remains open. R.D. Olson has constructed over 1,000 hotel rooms in the Southern California market over the past three years. The firm most recently broke ground on the 170-room SpringHill Suites by Marriott in Downtown Burbank, Calif. R.D. Olson is also currently collaborating with Marriott International on a 210-room Courtyard by Marriott in the heart of the Irvine Spectrum Center.